After 11 months, I am so excited to share how my teeth look after using Invisalign! This post is written in partnership with Defay Orthodontics, but all opinions shared are 100% honest and are my own. Thank you for allowing us to share with you products that we use and love with you to keep our website going! 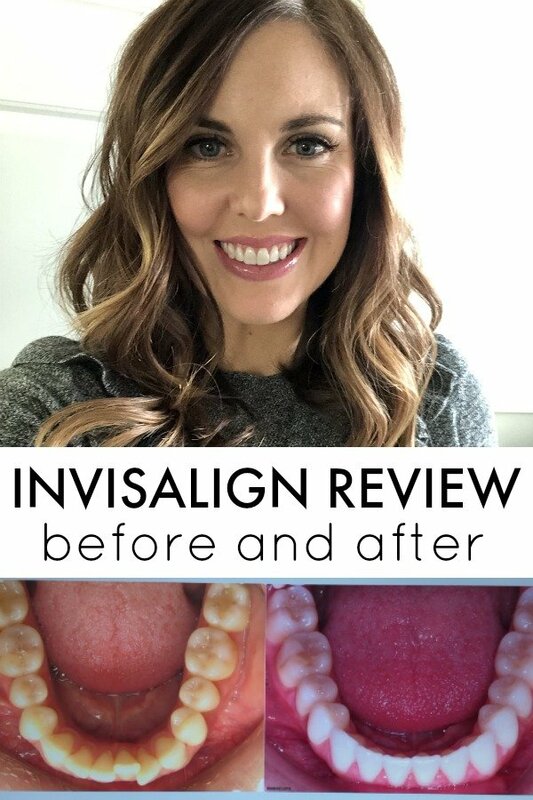 For those of you who have been following my Invisalign journey, I am so excited to share the end results with you today! YES! A million times yes, especially as an adult. 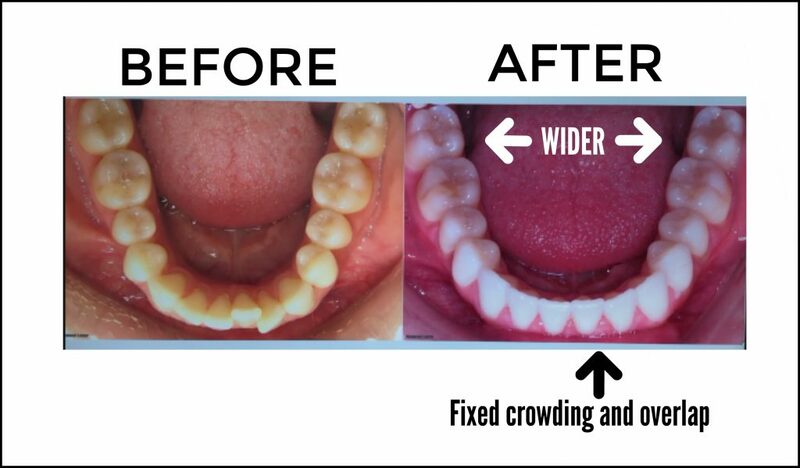 If you have ever felt insecure about your smile/teeth, this is such a wonderful option to fix them. I love that the Invisalign aligners are clear, I love that I could remove them in social settings or when going out to eat or when I had to be on TV, and I love how fast they worked to move my teeth! Of course, the only way that Invisalign will work is if you wear the trays for 20-22 hours a day, so you do need to be responsible. And that includes brushing your teeth and your trays after each time you eat . . . which gets hard to do sometimes (I constantly carried a toothbrush and toothpaste with me everywhere I went). It took 11 months from start to finish and in all honesty, I would do it again in a heartbeat. 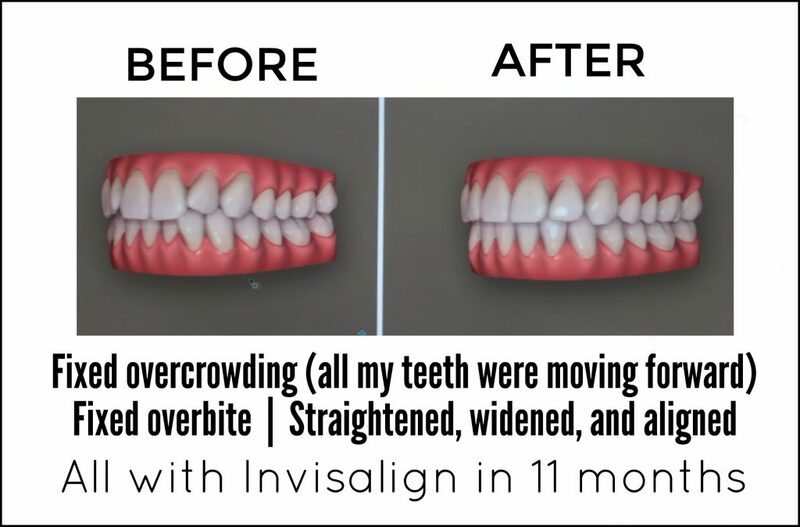 As one who had braces for two years, plus a mouth contraption that widened my mouth that I had to crank each night, wearing Invisalign was a breeze! 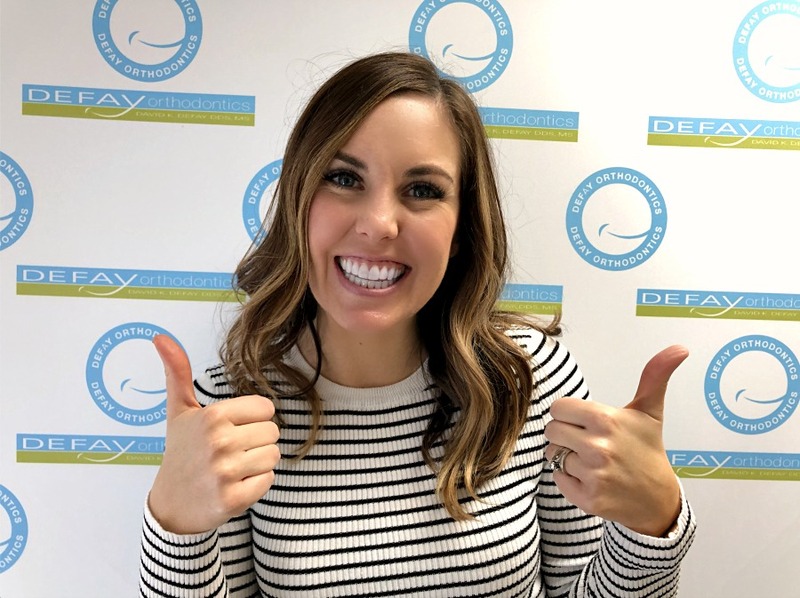 It definitely helped that I had an orthodontist who was an elite Invisalign provider and had worked with over 300 Invisalign patients – to learn more about him, visit Defay Orthodontics website. Consultation: Last January I went into Defay Orthodontics to see if I was a candidate for Invisalign. The consultation was totally free and they went over what my treatment would entail, if I chose to move forward. They also discussed payment options (they have a monthly payment plan that makes braces/Invisalign super affordable. You can learn all about my consultation here and what you can expect at that first appointment. Trays arrive: Because of the 3D digital impressions that they took of my mouth at my consultation, we were able to order my trays (a.k.a. aligners) right away! Dr. Defay actually makes some of the aligners in his office, so they can be ready within a day or two! Once your trays arrive, it’s time to start the transformation. I received my first 10 trays and was told to switch them out once a week. Attachments on my teeth: Something that I didn’t know about Invisalign was that you had small attachments (or “anchors”) glued onto your teeth while you are doing Invisalign. Those anchors are unique to your treatment plan – they help move specific teeth a little more. Invisalign would not be as successful without them. The attachments are clear and are hard to see unless you are very close to my teeth. 10 Week Check-Ups: Once I had my attachments on my teeth, I only had an appointment every 10 weeks to check on the progress (unlike when I had braces and had to get them adjusted monthly). The appointment was usually 10-15 minutes long and I would be given my next 10 trays and then be on my way. Attachments removed: After about 8 months of Invisalign, we removed my anchors and then I went into the “refinement period” – to be honest, I LOVED the way that my teeth looked at this point, but Dr. Defay is a perfectionist and wanted them to be up to his standard, so we made some small tweaks. Permanent retainer placed: Included in the cost of Invisalign is a permanent retainer. I was so excited about this because had I had this when I had braces before, I wouldn’t be needing orthodontic work again! I had a thin wire permanent retainer placed on my bottom teeth and then I sleep with a removable retainer on my top teeth every night. Soon I will switch to wearing the retainer less often at night, but for now, I am wearing it diligently!! my teeth before and after . . .
Invisalign doesn’t hurt. After having braces and remembering how painful they were (the cankers inside my mouth, the tightening, the headaches, etc), I was so worried that I would be going through that again. Thankfully, it wasn’t like that at all. I did have some discomfort on the first day (it wasn’t even bad enough to call it pain! ), but it was just from all the pressure of the trays getting my teeth to move. I felt like the movement was so gradual that I never had any pain from it. You brush and floss constantly! This was something that was difficult for me at first. I learned that I needed to carry a toothbrush and toothpaste with me at all times. I brushed my teeth in some random public bathrooms and had to excuse myself from the table at restaurants while I went and removed my aligners so that I could eat. But in the end, it was so worth it. And now I can’t stand it if my teeth aren’t clean. Ha ha! If you don’t brush your teeth after you eat, the bacteria gets trapped in the trays and then it turns into cavities. I heard horror stories of people who did not faithfully brush before putting their trays in and they had a mouth full of cavities by the time they finished Invisalign. It’s a great weight loss plan . . . This was something that I wasn’t expecting, but I cut WAY BACK on my snacking. Because each time you eat you have to remove your trays and then brush afterwards, it was just easier to not snack mindlessly . . . it wasn’t worth it to have to brush again!! I also never ate samples at Costco because it was too embarrassing to remove my slobbery aligners just to have a little sample. Ha ha! Removing aligners isn’t pretty . . . ha ha! I got a little better with time, but it was still hands-in-your-mouth slobbery. I would usually excuse myself to a bathroom or a private corner to remove them so that people didn’t have to watch. You have to commit! In order for them to work, you need to wear them for 20-22 hours a day. You have to be diligent and watch the clock while they are out and be sure to keep get them back in. There were times that it was so nice to have a break from wearing them, but I always paid for it later because my teeth would move so much in such a short amount of time! Your teeth will feel loose. This was kind of a strange feeling – I just felt like my teeth were kind of loose when my aligners were out. It is just because of all the shifting and movement that is happening and now that I am done, that feeling is gone. You drink a lot of water! Because water is the only liquid you can drink while your aligners are in, you drink a lot of it. I actually love water and it wasn’t a problem for me, but I thought that I would include this for those of you who drink other beverages. If you are looking to cut the soda out of your life, maybe Invisalign will help you do it! Can you tell that I am wearing my aligners in this picture? Because I am! I love that they are practically invisible. In the end, when all is said and done, I have LOVED the results that came from Invisalign. As I mentioned in the video, there is just a confidence that comes from having a smile you feel good about . . . and that makes everything worth it. And if you are in the Northern Utah area, I would HIGHLY recommend Defay Orthodontics. Their office staff has become my good friends and I am going to miss popping in for my appointments! You can find Defay Orthodontics on their website, Facebook, Instagram, and YouTube!